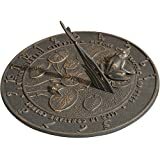 This cool new Sun Clock Sundial from Whitehall Products is an upgraded version of ancient timekeeping technology. 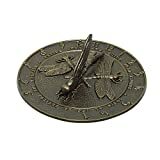 Rather than a gnomon casting a shadow on numerals like an analog clock, which no one seems to know how to read anymore, this modern sundial casts digital-like numerical shadows instead. 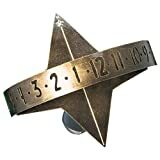 As the sunlight strikes it throughout the day, it casts the numerical hours across a dial band and the actual clock time is revealed at the center meridian line. For example, the image above reads 10:45 AM. 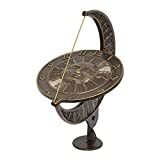 It can even be adjusted for daylight-savings time. 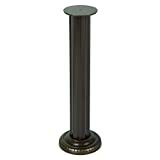 Each sundial is crafted in the USA from recycled aluminum, finished in a variety of weather-resistant colors, and can be placed atop a matching optional pedestal. Unfortunately, it doesn't work at night for obvious reasons.